Sometimes, you just get very very good days where everything is just working together and today was one of those for us at B&F. Sophie and our creative team are putting together an amazing mail order catalogue and I can’t wait to show you the end result. I really hope this is going to be a success because if it’s not, I’m not sure we will be in a position to produce another one as it is incredibly expensive to produce but we will cross that bridge when we come to it…. We also received the Mima Le Chat print (featured below in the minx’s bedroom with her new shooooees bought by her papa), the Bat print and Le Chat print and I frankly love them all! I got samples last month to shoot them for our catalogue and framed them all in Ikea’s white RIBBA frame. Next to each other they look stunning. 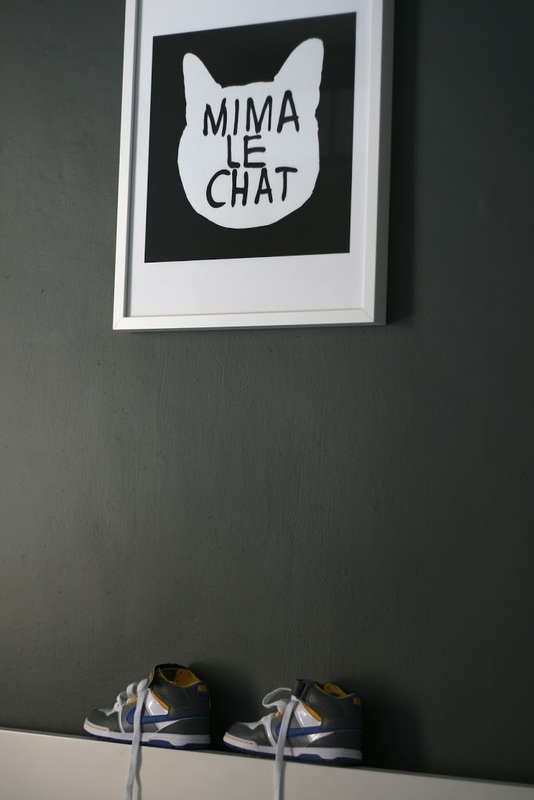 In the end, Mila selected Mima for her bedroom and I put Le Chat above our family mood board in the lounge. The Bat may end up in our kitchen…I don’t know yet. We have 6 new gorgeous prints from a new designer and I’m kind of wait to see how they all come together. We’ve also received boxes of gorgeous japanese masking tapes in lots of colours and I’m taking a couple of pink and blue rolls home tonight to have fun over the weekend. The masking tapes will be online next week. We have so many gorgeous new products in the pipeline from French, American and Swedish designers that I can’t tell you how excited I am. I’m totally restless! Luckily I have started this 4-week fitness plan from Marie-Claire to channel my energy. I’m on week 1 so I will let you know if I manage to do it until Week 4 and have then an amazing body….we can all live in hope! When BODIE and FOU customers are good at styling….